Wow! I’ve heard rumours that Eastwood were hoping to reissue the Ovation Breadwinner, and it seems this is as close as they’re gonna get – the Breadwinner tribute guitar. There are a few changes compared to the original Ovation classic (especially the headstock), but ya gotta hand it to Eastwood for making it happen. Electric Light Orchestra tribute bands, start your credit cards. CLICK HERE to see real vintage Ovation Breadwinner guitars on eBay. Eastwood Guitars debuted the new Breadwinner tribute guitar at NAMM 2009 last month to much praise and excitement. The distinctive shape and unmistakable look of this classic model is a showstopper. It brings back memories of the most diverse cast of players like no other guitar, including David Cassidy, Glen Campbell, Robert Smith, Colin Newman, Wally Bryson, Steve Marriot, Tom Morello and Ace Frehley. We can’t imagine that crowd has anything else in common other than the weird and wonderful Breadwinner. The Breadwinner is available in white or black with white pickguard. The unique form fitting solid mahogany body and 24 ¾” scale maple neck with rosewood fingerboard and 1 11/16″ nut, make this guitar one of the world’s most ergonomic designs with unsurpassed comfort and balance. The cutaway shape allows full access to the 24th fret. This is the first Eastwood model to feature Active Mini Humbuckers with a 3-way and an active on/off switch. The Breadwinner comes with a traditional custom hardtail or an optional Strat style tremolo bridge. To protect this six string 70s dream-machine, Eastwood has created a custom fit deluxe hardshell case, which will be included with the first 48 guitars (so order today). “The Breadwinner has been one of the most requested models that fans have wanted us to recreate”, stated Mike Robinson, President of Eastwood Guitars, “and from the response at the NAMM show, it will become a very popular model for Eastwood”. The Eastwood Breadwinner tribute guitar is in stock now and is shipping worldwide. For more information, visit their web site at www.eastwoodguitars.com. 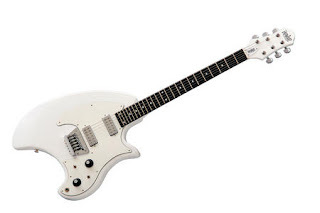 Whatever one’s opinion on Jack White, it can’t be denied that the popularity of The White Stripes a few years ago worked wonders in prompting Eastwood to revive Airline guitars (and for the record I dug White Stripes, so don’t mistake my flippancy for cynicism). After several years and a lot of great reviews, they’re zeroing in even closer to the ultimate modern Airline reissue. Eastwood Guitars debuted their new AIRLINE® ’59 Custom Series guitars to rave reviews at NAMM 2009 earlier this month. The Airline ’59 Custom 2P and 3P are the first guitars in the new Airline Custom Series and have elevated the quality reputation of Eastwood Guitars to a whole new level. The ’59 Custom guitars deliver many new features to the AIRLINE brand. These guitars feature a unique rubber binding which surrounds the entire body, and replicates the esthetics of the original Airline Res-O-Glas guitars. Additional cosmetic details include a striped pickguard, aluminum tone switch plate and available NOS Valco knobs. Both the ’59 Custom 2P and the ’59 Custom 3P guitars are fitted with the high output Airline Vintage Voiced Single Coil pickups. These models ship in the new Vintage Style Deluxe form-fit AIRLINE hardshell case with steel plate logo. “It has been five years since I asked our engineering team for that rubber binding”, stated Mike Robinson, President of Eastwood Guitars, “and I can say it was definitely worth the wait. Over the past six years, our AIRLINE series has built a great reputation for playability and tone, but now we are setting a new standard in guitar esthetics with the new ’59 Custom Series”. The Airline ’59 Custom 2P is available in red and the Airline ’59 Custom 3P comes equipped with a BIGSBY tremolo and is available in black or seafoam green. Both new models are in stock now and are shipping worldwide. For more information, visit their web site at http://www.eastwoodguitars.com/. This just landed in my inbox… now THAT’S the stuff. Want!!! 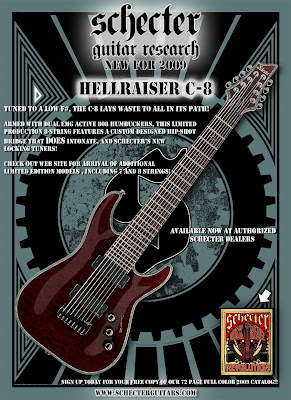 The new Schecter Hellraiser C-8 has 8 strings (the lowest is tuned down to F#, but I figure that if you’re going to go that low anyway, you might as well tune it down to E so you can play octave-down power chords, Drop-D-style. Click the image for a closer look or go to Schecterguitars.com. CLICK HERE to buy the Ibanez RG2228 Electric Guitar Galaxy Black from Musician’s Friend. CLICK HERE to buy the ESP LTD SC-308B Baritone Stephen Carpenter Electric Guitar Black from Musician’s Friend. Despite my well-known geekiness for pointy shred axes and stuff, I’m not shy about admitting I love old-school axes with that Made In Japan, pawnshop-prize charm, and this is one of the charmiest I’ve seen in recent times. Sometimes you’ve just gotta put down that sleek Ibanez RG and pick up something that looks like it was drawn for a cartoon. Especially if it’s avocado green. Man, now I want Mexican food. Sparrow Guitars is proud to have introduced the Von Drat surf guitar at the 2009 NAMM Show. The Von Drat is the newest addition to Sparrow’s family of retro guitars which includes the Big Daddy, Primitive, Rat Rod and Twangmaster models. The Von Drat debuted at the 2009 NAMM Show Hall D Booth #3394 in Anaheim, California from January 15-18th 2009 at the Anaheim Convention Center. The Von Drat joins Sparrow’s Rat Rod and Twangmaster as available in the premium “Continental” line. Made in Vancouver, BC Canada, the Von Drat surf guitar features Burns Tri-Sonic pickups, Grover tuners, bone nut and Wilkinson tremolo. With an alder body, maple neck and rosewood fingerboard, the Von Drat is a 21-fret, 12″ radius, 25½” scale length guitar with the volume and tone top-hat knobs and three-way selector switch located at the lower bout for versatility and playability. The Von Drat is currently available in Tudor Black and Avocado Green, with custom pickguard. The guitar is the namesake of Toronto, Canada-based surf outfit The Von Drats. The Von Drats were hired by Sparrow Guitars to play an event as part of the 2008 MIAC Show in Toronto, Canada and became instant favourites of Sparrow staff. From that meeting, Sparrow President Billy Bones began planning and designing what would become Sparrow’s Von Drat guitar. For more information, visit their web site at www.sparrowguitars.com. 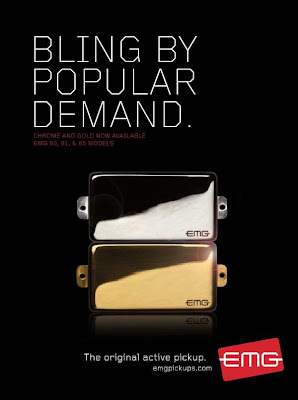 This year at NAMM EMG introduced gold and silver covers for their pickups. Previously the only time I’ve seen EMG pickups in anything other than black was on Kirk Hammett’s Les Paul. Other new goodies include a new line of pickups called the X Series, and an Alexi Laiho set which includes his favoured passive humbucker and a gain boost. Team EMG is back from the 2009 NAMM Show and without a doubt we had a blast. The reaction to our new products was a resounding success. If you haven’t heard we are now offering high quality Chrome and Gold cover caps for our 81, 85 and 60 models which generated considerable excitement. In addition to this new option, we also have a new line of pickups called the X series which has been highly anticipated and that we are betting will blow players minds with its increased headroom paired with the traditional EMG tone that has become iconic to musicians the world over. The final new release is Alexi Laiho’s shredding new signature set, the ALX w/ABQ gain boost, which is composed of a signature passive HZ humbucker paired with a 3-band EQ/gain boost mounted on a push pull pot. This new set is incredibly versatile and was developed in conjunction with Alexi himself. 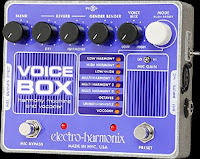 You want his tone? This will get you that much closer! Besides featuring EMG’s new and existing product lineup, we had some very exciting artist appearances, scheduled and unscheduled, that were just icing on the cake and made our booth THE place to be. Some of the artists hanging out included Kerry King, Alexi Laiho, Steve Lukather, Sergio Vallin, Marcus Henderson and many many others. 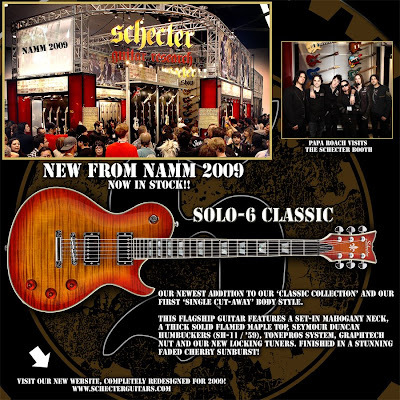 Here are a bunch of new 2009 Schecters. Just click the images to see the full-sized versions. I especially like the ATX V-1, and it’s cool to see Seymour Duncan Blackout pickups rapidly finding their way into production guitars.